Robert L. Green, who holds a Ph.D. in Educational Psychology from Michigan State University (MSU) and B.A and M.A. from San Francisco State College, is a former president of the University of the District of Columbia and former dean of the College of Urban Development at MSU. From 1965-1967, Dr. Green worked for Dr. Martin Luther King, Jr. as the education director of the Southern Christian Leadership Conference. Dr. Green is dean and professor emeritus, Urban Affairs Programs, MSU. A nationally known scholar, Dr. Green is an expert on education, urban development and issues related to diversity. He has advised mayors, state legislators and community leaders on policy and provided counsel to college presidents and administrators on curriculum and faculty development. In addition, he has served on court-appointed committees in cases involving education-related fair employment issues and provides consulting services to corporate leaders, advising them on employee morale, productivity and workforce diversity. Also, Dr. Green has been a prominent organizer of school reform initiatives and major education forums. He served as a consultant and facilitator of several annual summits for the National African American School Board Members and coordinated Community Education Partnership Summits on academic achievement and school reform in San Francisco and Dallas. Moreover, he has worked on school reform efforts in Memphis and Portland, Oregon and directed a grant-funded research team that evaluated the Detroit Public Schools. In addition, he has provided staff development training for many public school districts – among them, Dallas, Chattanooga (Hamilton County), Las Vegas (Clark County), Detroit and San Francisco. His work has focused on the impact of poverty and discrimination on urban populations and explored the relationship between expectations and student achievement. He’s written many articles on student achievement and school reform and has edited and authored ten books. He edited Expectations in Education: Readings on High Expectations, Effective Teaching, and Student Achievement, (SRA/McGraw-Hill, 2009). He is the author of Expectations: How Teacher Expectations Can Increase Student Achievement, (2000 and 2008). He also wrote The Urban Challenge: Poverty and Race (1977), a top-selling book that was required reading for many university courses. Most recently, Dr. Green and his associates co-authored “The Expectations Factor in Black Male Achievement: Creating a Foundation for Educational Equity,” a solutions brief presented at the 2012 National Summit on Educational Excellence and Opportunity for African American Males, an event convened by the U.S. Department of Education and the Council of the Great City Schools. That report and other papers presented at the summit are part of A Call for Change, a 2012 anthology published by Houghton Mifflin Harcourt. Also, Dr. Green and three of his associates produced Expect the Most – Provide the Best, a 2014 Scholastic Inc. book that examines the impact of expectations and digital technology on educational achievement. In addition, Dr. Green is completing his autobiography – At the Crossroads of Fear and Freedom: A Memoir on the Fight for Social and Educational Justice. His research and writing contributions include a W.K. Kellogg Foundation national report on strategies to improve the quality of life in urban communities. He is also the author of a major article on school reform published in The Annals of the American Academy of Political and Social Science. As part of an effort to address the low graduation rate in urban schools, Dr. Green’s consulting team recently produced a report that enabled school principals to share information on how to address the drop-out problem in the Clark County School District and its Las Vegas schools. Moreover, his entry “Teacher Expectations and Compensatory Education” was published by Sage Publications in 2012 in the Encyclopedia of Diversity in Education. In 2002, Dr. Green received the International Gandhi, King, Ikeda Award for Human Rights and Peace Initiatives from Morehouse College. 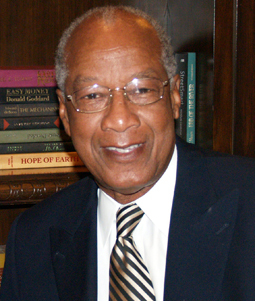 In 2004, he received the Distinguished Alumni Award from MSU. In 2009 he also received the Distinguished Psychologist Award from the Association of Black Psychologists and the “Living Legends” Award from the National Alliance of Black School Educators. He is a member of Phi Kappa Phi National Honor Society. Dr. Green also serves as the Clark County, Nevada Chairman of “My Brother’s Keeper,” a 2014 Initiative of President Barak Obama to uplift the Education , Health and Employment status of Men and Boys of Color.